Can't find that Fantastic Four: Rise of the Silver Surfer Slurpee cup at a friendly, neighborhood 7-Eleven near you? Despite last weekend's box office numbers, the Fantastic Four sequel is merely yesterday's news, compared to last week's debuts of Die Hard 4, Ratatouille and Transformers. And, I suspect, The Simpsons Movie, opening in three weeks, may rule the roost when all's said and done... which leads me back to the question about what the heck happened to those FF cups. Looks like they may have been dumped for another movie tie-in. 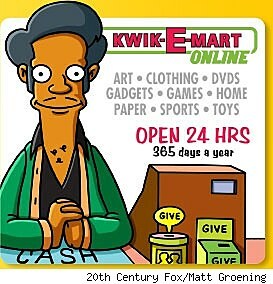 Thanks to The Simpsons Movie, a dozen 7-Elevens across the United States are getting a temporary makeover, converting for the month into Kwik-E-Marts. Those stores, along with most of the rest, will sell such Simpsons ephemera as Buzz Cola, KrustyO's cereal and Squishees slush drinks exclusively, according to the Associated Press. One of those 25 products may interest comics fans a good deal, according to Advertising Age: A special plastic-wrapped issue of Radioactive Man (#711) and sold exclusively at 7-Elevens for $3.99. Click the images below for full sized versions.